As a wedding photographer, I am fascinated by how technology is changing our industry. 20 years ago, the professional photographers were admired, adored and respected and every special event was documented properly by them. In contrast, on this wedding day I good spot at least five photographers taking pictures at Château Le Parc. They were guests and their equipment was in several cases better than mine and my second shooter's. However we all know that a good camera doesn't make a professional photographer. 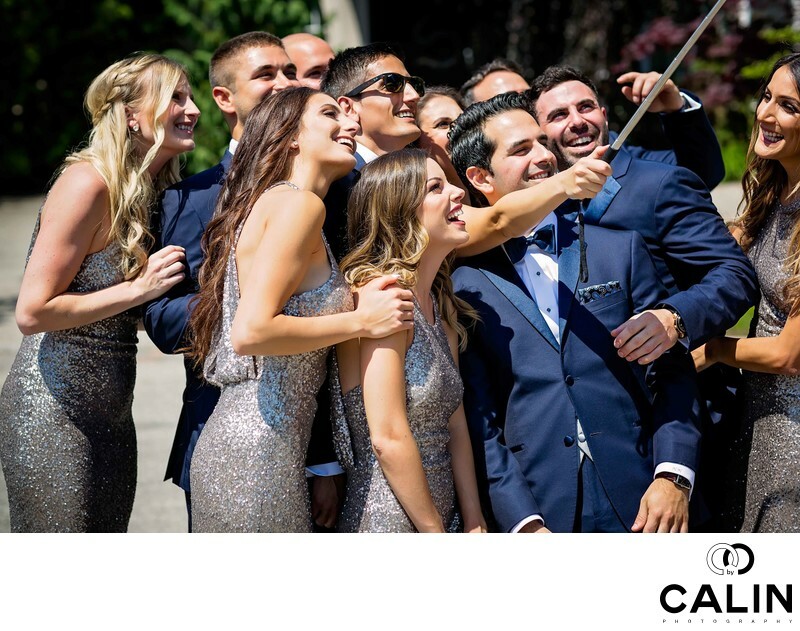 In this wedding album spread we can see the bridal party taking a selfie. They are so absorbed, that they didn't notice or didn't mind my presence. That makes this a beautiful candid photograph that the bride and groom love enough to include in the album. Speaking of the couple, they were present but hidden. The groom was hiding in the house while the beautiful bride with waiting in the limo for the right moment when she emerged for the first look. Well in this image there are a few things that could have been improved. For example the lighting is coming from the wrong angle, which often happens with photo journalistic images. Of course, I have suggested the party to turn around so the sun will give them from better angle but that would have ruined the moment and I want to capture a genuine reaction rather than a pose.